If you open your meter box lid and you see standing water don't be alarmed. It is not unusual to see standing water inside of a meter box. 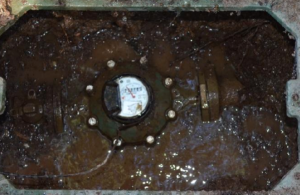 The cause for water inside a meter box can be due to several conditions. The most common cause of water to appear inside of the meter box is rain. During the rainy season in Carmichael, water runoff from rain can often enter the meter box. The standing water will normally drain out or seep into the soil after a rainstorm. Another cause for standing water inside a meter box is over irrigation. This is most common during the summer months when customers are more actively running sprinkler systems. A simple adjustment of your irrigation timer may eliminate the standing water. In some cases water inside of the meter box may indicate that there is a leak near the meter. 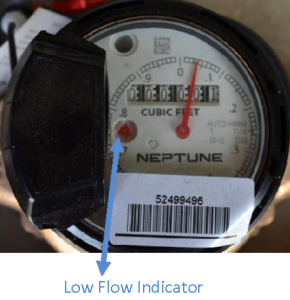 Check the meter to see if the low flow indicator is spinning (see picture below). If the meter is spinning it may point to a leak on the private side of the water service. If the meter is not spinning but water continues to raise inside the box there may be a leak on the District side of the meter. If you need assistance in determining the source of the water leak please contact our office at (916) 483-2452.